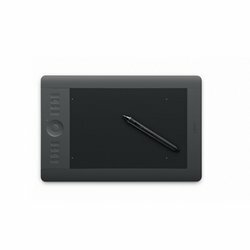 The digital drawing tablets for graphic designers and artists are a brilliant tool for making your creative work easier. All the genius things are very simple and easy. Just like an electronic drawing pad that allows you to get creative anywhere and everywhere. Here is a thorough list of the latest models that came out in 2018 so you can choose the best drawing tablet just for your career. Before such works had to be completed sitting with a bulk computer and the tools were not that smooth and swift. Now you have a new thing to help you with your projects if you have never tried using a graphic drawing tablet you’re missing out on your best creative opportunities. Fear not, you do not have to browse through hundreds of drawing tablet reviews. We have you covered no matter if you are an experienced CGI animator or if you are looking for your very first cheap drawing tablet. The reviews for computer graphic tablets are the best source of relevant information. Of course, you can look through manuals and specifications but in this business reviews and consumers ratings can make you or break you. It would not be possible to just give you the one specific brand and model to cover all your needs. Every customer is unique thus guidelines and rating have to be inclusive. No matter if you want an affordable drawing tablet, best drawing tablet for Photoshop or the best drawing tablet for animation we have some ideas and options for you. The main reason why I put this item on the top of my list is simple. 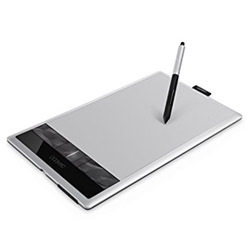 It is the best graphic drawing tablet according to the value for money ratio. It might not be the most powerful pad out there and it won’t wow your colleagues and friends. But Huion Inspiroy G10T can fit your entire family. This gadget is very easy to set up. Your kids will easily handle it as we consider it to be the best tablet for drawing and creativity when it comes to a younger audience. It is very responsive to reacting to even the lightest strokes. It is compatible with Microsoft Windows starting from version 7. And with Mac starting from version 10.10 and latest. It is extremely affordable and won’t break the bank. So if you are on the budget this one would be the best graphics tablet for you. You might encounter issues with installation. In case you have to face the secondary driver conflict we suggest you disable the secondary and peripheral drivers while installing the program for Huion Inspiroy G10T. If you are willing to pay extra for some luxury and technology this won’t be the most suitable option for you. 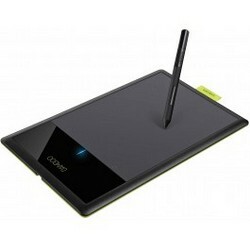 If you are looking for the best digital drawing tablet you might be interested in this one. This one is five times expensive than the previous one I have mentioned above. But this gadget also has some very cool options like the great pressure sensitivity, tilt sensitivity and no lagging behind the response. Every small detail is thought through, even a pen has got a stand for it, together with all the interchangeable tips. The large size of the Wacom Intuos Pro Large is actually a huge advantage. Work with a full A5 format wherever you go and access it on your PC whenever you want to. The model is lightweight. It is ergonomic and feels very nice to the touch. You get to have more than 8000 pressure sensitivity levels so the drawing comes out super realistic. The pen for this Wacom Intuos Pro Large model is not compatible with any other Wacom models. However, the pens from the previous tablets can work with this one just fine. Make sure there are no hiccups when uploading files from the large to the regular tablet. But if issues happen you can always reconfigure the old one and it should be fine. The nibs wear out quite fast unless you are being very soft and gentle on them. Here you have one more fresh nominee for the best drawing tablet awards. This pad has got one cool feature that makes it stand out. And no it is not the price. It has a pen that can function as a brush, a pencil or a marker. The tilt control, stand, shortcuts, and key ring menus are also available. But that is just the basis for this gadget. So what makes it the best tablet for drawing? This one has a realistic feel to it so you will definitely feel like painting with a brush and a canvas. More editing freedom and crisper colors. Now you can focus on the details much easier and learn new tools faster. An advanced version of the traditional Wacom pen. This new PRO pen has different nibs and tips as well as various rubber rings to change the size and shape of it. The cable that connects Cintiq and your computer is very thick so if you are going to rest the pad on your lap it might cause some inconveniences as the cord is hard to bend. Customers report having issues with the support center. There were similar complaints in a few drawing tablet reviews for this model. You might have a hard time with the driver compatibility. This cheap drawing tablet made the cut for a reason. This tiny gadget although looks and feels very simple can satisfy all your creative cravings. We love the value for money and we appreciate a quality product. it might be the best cheap drawing tablet, you decide. The affordable brand Huion goes after the pricier competitors. This might be the best budget drawing tablet you have been dreaming of. Read on to see why it is so lovely. It won’t break the bank. The value of this product is really good and you also get the quality that comes with a 12-month warranty. Not bad for a small pad right? The design is functional and the buttons are built in to be convenient. So if you are a leftie and worry about accidentally pushing the buttons fear not. It might be an inexpensive drawing tablet just for you. A realistic surface with a lot of space plus a comfortable pen. It is a pleasure to hold and a pleasure to paint. Your hand would never get tired. The drivers can be trouble. Make sure to reinstall the device in case some keys or shortcuts start to fail. Also it might not be compatible with the latest software versions. The customer support is hard to reach. They might not be able to reply right away and are mostly available through emails only. It is not designed as ergonomically as the counterparts. It might feel like cheap plastic. Another worthy competitor in the cheap drawing tablet segment. You would not have to worry about your kids breaking it etc. It has a pen that works from an AAA battery and is connected to your computer through the USB. Everything is easy and simple, you might call it boring. This device although looks plastic and basic is a great option for when you just need a cheap drawing tablet for pc. It might not look as fancy and it does not have any perks like tilt control and stuff. The customer support might be available at odd hours. It is extremely affordable. 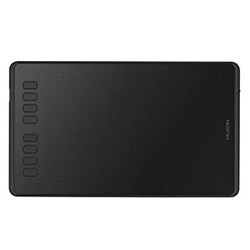 This is another cheap Huion tablet. It actually is, just labeled under the Turcom brand for Amazon. So if you are familiar with other affordable Huion pads you know what this one is like. It has got shortcut hotkeys and the interactive drawing area is big. Really comfortable for drawing. The design is sturdy and durable. Can it be the best drawing tablet under 100? You decide. The drivers that come in the product package are obsolete. You have no choice but to go on the factory website and look for the recent version of the pad software. In case you break or lose your pen you cannot buy it separately. Might be hard to configure your Adobe software to work with this pad. Our last competitor for the best cheap drawing tablet title. This XP-Pen product is a few dollars above the competitors in the affordable department. Of course, you came here looking for a drawing tablet that is cheap. But this particular one is really nice because it gives you more options and more features. Although this brand is not as famous as Huion aka Turcom but it is just as good when it comes to the quality and can be a great drawing tablet for your pc. Of course, if you do not expect miracles from a cheap pad. So why did we like it? This one can be connected to the computer using both USB wire and the wireless receiver. The pen for this pad does not require a battery and does not need any charging. There is also an anti-shake technology so even if your hands are shaking the lines will still be crisp. It is compatible with both MAC starting from 10.8 and higher and Windows starting from version 7 and up. The manufacturer also claims that it behaves well with all the recent drawing software. Some users would complain on the accumulator saying that it had stopped charging after a few months of regular use. Drivers might be an issue — just reinstall them for a few times. The customer support is very hard to get a hold of. The office is located in another country and the working hours are at night when you sleep. There is not one single the best drawing tablet for beginners. Are you a rookie that wants to become a professional illustrator? Or you just need to have a pad for your amateur paintings? One drawing tablet is best for one thing one is the best for another. Even though the price is modest it is advanced and has a lot of nice options. You can edit your work directly on the pad. The stylus is made in the shape of a pen and needs no charging. You get to enjoy an 1800 angle of vision allowing you to see your work from all angles. This way you will be able to see and study all the smallest details. It was built with lefties in mind. So no matter if you are right handed or left handed this pad will feel nice and natural in your hands. There were cases of the screen going black and the device shutting down by itself. The company provided a driver might not recognize the device. You will have to reinstall everything again. The customer service is very slow at replying according to some of the customer feedback. We have come up with a few options that are student\beginner friendly. All of them are affordable and super easy to install and to use. This drawing tablet for beginners is so cheap it is ridiculous. This sketchpad has all the same basic function. You get a stylus in a shape of a pen, nibs included. The manufacturer claims it is compatible with all the OS and all major drawing software. Only a paper drawing album can be cheaper than that. We cannot claim that it is 100% the best drawing tablet for beginners. But we had to add it to the list. It is about 30$ now, any enthusiast can own it at that price point. It is very easy to use so even if you are a beginner you will get it super fast. It might be missing out on some cool features but you get all the basic functions. The pressure sensitivity and the response time are pretty decent in spite of the low price. You will have the same experience as with a professional tablet. This graphics drawing tablet might not be compatible with your PC as some Windows users claimed installation and compatibility issues. The pens for this pad tend to break down fast. So be careful with it. Sometimes the lines won’t record so you have to pain again. The tracking might wiggle spoiling the line. This digital drawing tablet for beginners is also very easy to use even if you have never drawn on a sketchpad before. The Wacom Intuos Pro Medium is really famous for the brand name. We have spoken about its older brother, Wacom Intuos Pro Large in the best of the best section of this review. 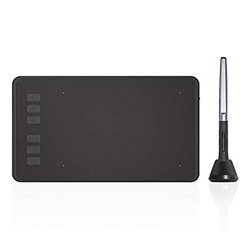 If you need something reliable yet modern with a lot of functions and are willing to pay some extra this will be the best beginner drawing tablet for you. Wacom is the biggest company on the portable drawing tablet market. They are famous for their products and for the good quality. It is made of metal so it is very sturdy and durable. Do not worry about it falling down on the floor. It will last for a while and serve you well. 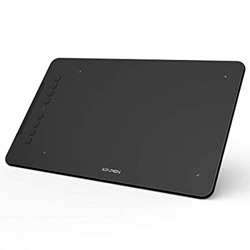 It is also wireless so you can edit your drawing or photo separately on the pad and then connect to the computer and load it there. You might have stylus issues. The cursor can disappear on the screen. You might have pen scratches on the surface of the interactive screen area. For this reason, you might consider purchasing a protective screen. You can have different films some imitating paper structure etc. The Bluetooth connection is slower and makes the drawing lag behind. Which might require some getting used to. There is a reason why Wacom Cintiq 13HD is the best drawing tablet according to our data. You can see the full review for the product in the best of the best section of this review. We also had to put into this the best drawing tablet with screen section as the Cintiq screen is amazing. The reason for it is that you get to have the most realistic experience. The pad feels like paper and the colors are very clear and bright making them look natural. All this comes with the latest technologies and a new version of the stylus pen. Wacom is one of the best drawing tablet brands. 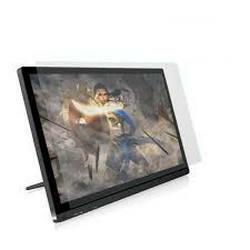 Another competitor for the best drawing tablet with screen. This pad is way more affordable as comes from a cheaper brand but also has a vast array of benefits, options and tools. You can enjoy about 16 million shades together with a new set of nibs, two new ergonomic pens and a Full HD resolution interactive display. You get a special anti-glare screen that protects your eyes. It comes as a part of this computer drawing tablet package. The charge on the stylus will last through a month of heavy full-time exploitation. So you do not have to worry about it failing you when you least expect it. The color is so pristine you will not have to calibrate it at all. If it still looks different on the screen you might look into the screen brightness. The cable placement is not thought through enough. If you lay this pad flat on the table it will wobble as the cable holes are protruding beyond the stand legs when they are bent. The protective screen for this sketchpad is not good as it is way too glossy and gives you a lot of glare according to some users. You might have to take it off and clean the screen from the glue residue. The customer support team is located in China. You might have to struggle with the poor English. 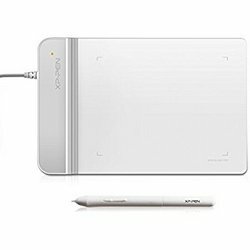 Since Wacom is a champion on the electronic sketch pad market we had to make a comparison of its two best models so far. Wacom Intuos Pro Paper Edition being the top pick for a few solid reasons. You are already familiar with the Intuos line and know that they are good. Well the paper edition is definitely the best Wacom Intuos drawing tablet. So what makes it the best Wacom tablet? You get to enjoy the multipurpose screen that has a paper texture. In case you like it smoother or rougher you get samples of various screen covers with different feel and thickness. The pen is super swift and responsive. There will be no lagging behind. Programmable hand gestures option which is really cool. Customize your computer drawing tablet to fit your own needs. The rougher the surface is the faster the nibs of your stylus will wear out. So you can either change the nibs or get a smoother film. The side buttons feel a bit too hard to press. It might take some getting used to. Or you can just use other shortcuts like hand gestures etc. The Cintiq is hands down is a candidate for the best Wacom tablet. It is an absolute hi-tech masterpiece. You have already read our professional review of it. The price of it is on another level and some artists might be skeptical but fear not. Once you try it you will hands down love it. And you will not want to come back to the sketch pads you’ve used before. 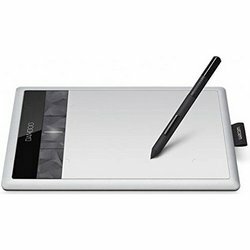 So which one is the best Wacom tablet for drawing? You get to decide for yourself. It is our ultimate pick for the best drawing tablet for Mac. The Huion is a Chinese brand which is a leader when it comes to affordable digital sketch pads. The price mark is unbeatable. This pad is irreplaceable for both hobbyists, students and full-time artists. Of course, you do not get the paper feature or the wireless connection. But you get to enjoy many modern perks like full compatibility with all the painting and graphics software, express keys etc. The price is so low anyone can afford it. Do not expect this pad to do miracles for you. But it is nice and simple and for the price you do not have to worry about breaking it or losing it. This computer drawing tablet is good for both lefties and righties. Nobody has to feel any discomfort. The pad is small but you can calibrate it. Change the screen size and the pressure sensitivity. The device is very universal. This drawing pad for Mac can only be connected through the wire. There is no wireless module or Bluetooth. Sometimes you might be to struggle with sensitivity ending up with wobbly lines. You can have problems with the stylus pen getting stuck or lagging behind. 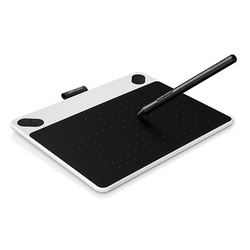 Every electronic sketch pad comes with a stylus aka an electronic stick that imitates a drawing tool, a pen and a computer mouse all the same. Most of the pad pens are ergonomic and designed for a continuous use. You also need to have a set of different nibs or tips for your stylus. This way you pick the line size and crispness. These days about 99% of all digital drawing tablets come with the stick and a set of tips. The major difference is in the way the stylus is powered. Most of the cheaper pads have AAA battery-powered pen. The more expensive options can have a rechargeable stick. But the duration of charge and the operational times can still wary from one brand to another. The latest option is the no charge stylus that is powered from the pad by the electromagnetic frequency. These are found in the latest models. XP-Pen Star05 is among the affordable pads with a stick like that. These are good for both hobbyists and professionals. The display is, of course, an advantage as you can see exactly what you are painting. No need to run your eyes between the computer screen and the sketchpad anymore. The best tablet for drawing comics would be the one with a big high-resolution display. But remember that this option is pretty costly and you would have to pay a few hundred for it. This option is way more affordable. The sketchpad does not have its own interactive screen. You paint on the tablet and the lines resurface on the computer screen. The electronic drawing pads like that are way more common. You can get one for under 50$ and have a quality product that will serve you for years. Ultimately the choice is yours. All portable drawing tablets use pressure sensitivity as a tool to recognize how thick the lines should be. Basically, if you push your stick harder into the pad it will respond with a denser line. Modern sketch pads can have anything in between 1000 and 3000 pressure levels. If you are a beginner you do not have to bother about your pad is not sensitive enough, 1000 points will be enough for you. The more experienced you are the more sensitivity you expect from your pad. Thus if you are a full-time artist or plan on becoming a professional you need to look for tablets with the greater amount of sensitivity. The resolution for graphic drawing tablets is calculated in LPI or lines per inch. Modern pads can have up to 6000 LPI and more depending on the brand and the price point. Usually, you do not need as many as 6000 LPI to draw even if you are a professional. But still, you should pay attention to this figure when making a purchase. When you paint something on the pad it should resurface on the computer screen right away. If you see that the sketch lags behind it means that you have responsiveness issues. This feature is really important when you use a wireless product. The best wireless drawing tablets should not have any responsiveness issues at all. So before making your final decision you should make sure that your pad has good responsiveness no matter if it is connected through the USB or through the Bluetooth etc. It will be very easy to pick the best computer drawing pad to fit your own needs and budget using Topchartex.com tools. We have thousands of loyal fans coming back to the website for a thorough comparison graph. You get to pick the items you want to compare and the program does the rest for you making your search very easy, quick and fuss-free. Another cool thing you can find on our website is expert reviews, tips and generally a lot of really valuable information. Be sure to come back to us every time you need help.